Earned content or media is publicity generated via a 3rd party. It is based on sharing information and includes reviews, social media mentions and interactions, and published mentions in other formats like print or broadcast. It is an integral part of today’s marketing mix, along with paid content (like advertising) and owned content (self-generated content like a blog or social media posts). 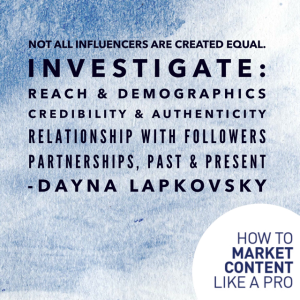 Take note, the lines between earned and paid have become blurry as some media and influencers require payment to report on a brand or company. Why would a company or brand want to execute a media/influencer campaign? How do you choose which influencers to target? We executed an influencer campaign, now what? Once you have earned some content, you need to use it to your best advantage. Recycle it, and share it back with your audiences in the form of a blog entry, social media post, video, testimonial or newsletter. And don’t forget to always tag and thank the influencer who created it! Looking to generate some buzz for your brand via a media or influencer outreach campaign? We can match you with the most impactful influencers to get your message across. Get in touch to learn more.